Re: Fourth of July recipes! I don't have a recipe, but over on the "Up the East Coast" thread, I just wrote about how for family gatherings on the Fourth, my mother used to make baked beans, starting with dried lima beans (you soak them overnight before you cook them) and using lots of brown sugar, molasses, and bacon. Jeff, this dish sounds very similar to a traditional Swedish dish, bruna bönor - brown beans. 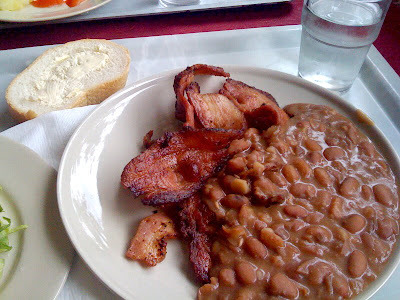 It's also made of beans, sweatened and served with smoked pork. I hated it in school, and have never eaten it since. Too bad. Looks good to me! I guess you'd better go eat a sheep, then. I'm sure you'd like it, maybe even better than soup! I like beans just fine, but it's the sweetness I couldn't take with this particular dish. Well, I am pretty good with a can opener. Maybe we should feature this cake from Food Network! Hannah brought home this exemplar last year; some classmate had brought it to school. Independence Day draweth nigh! What goodies are being prepared by those who celebrate?? actually, I'm not preparing anything, for a change.